At Willowood Pottery, I make functional pottery for everyday use, to enrich the enjoyment of food and life. 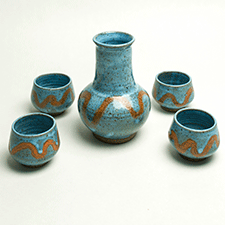 Craft pottery is a work of art, both decorative and utilitarian. Form follows function in the design of our hand-made pieces, offered at affordable prices. Willowood pots are essentially variations of useful forms for the home: mugs, bowls, teapots, vases and plates, produced in our specially formulated stoneware and porcelain. While the originating clay and glazes are base substances – literally from the earth – a potter transforms them into something elevated and elegant. 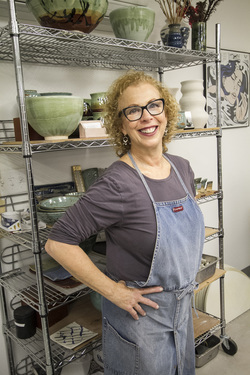 Caryn Newman has been making pots for 40 years, beginning with her apprenticeship in traditional Japanese production techniques at the Great Barrington Pottery in the Berkshires, then as a founder of Crow Hill Pottery in Abbot Village, Maine. She is a graduate of Douglass College, Rutgers University. She is a juried member of the Bucks County Guild of Craftsmen. Classes are offered at the Willowood Pottery Studio in Ewing, New Jersey, 20 minutes from New Hope. Studio tours are welcomed by appointment.